degree in entomology and pomology, and he stepped in to oversee the family business. Steven’s father had left the farm to his mother, three sisters, and Steven. At first, Steven continued to farm conventionally, not wanting to take any chances. 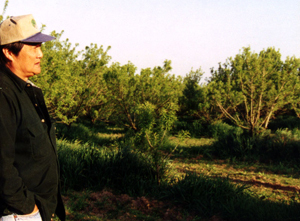 However, in the late 80s, he diversified the orchards by planting some asian pears, plums, and nectarines, and he began selling through farmers’ markets. Customers at the markets were interested in organics, and Steven felt that he could meet their demand. In 1990 he began to transition the entire farm to organic production, slowly converting one parcel at a time. In this way, Steven transformed his family’s farm from a conventional operation growing two crops destined for processing facilities, into a mixed orchard producing fresh fruits and almonds for farmers’ markets and a few retail stores. The entire farm has been certified organic by CCOF since 1997.